MEXICO CITY (Reuters) - Walmart Inc will acquire Latin American food delivery service Cornershop for $225 million, it said on Thursday, in a move to ramp up its online grocery business in Mexico and Chile. The deal mirrors Walmart's growing investments and tie-ups in online delivery services across the globe, as it aims to compete with Amazon.com Inc, the world's largest online retailer. Shares of the retail company's Mexico division, known as Walmex, jumped more than 3 percent on the news, closing at their highest level since late July. Walmart's acquisition of three-year-old Cornershop, which offers its service through a mobile app and was founded in San Francisco, will help it quicken deliveries for its Walmart, Superama and Sam's Club stores in Mexico, analysts said. "We believe the transaction is positive and will result in greater efficiencies and higher growth in online sales," Signum Research said in a report. 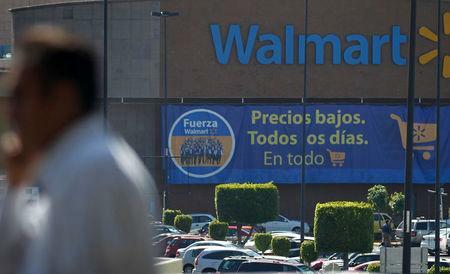 Walmex said it would absorb Cornershop's Mexico operations. Walmart aims to deliver food to more than 40 percent of U.S. households by year's end using delivery companies like Uber Technologies Inc [UBER.UL]. In Canada, the company will team up with startup Instacart for on-demand grocery deliveries. Walmart said it expects the Cornershop deal to close by year's end, adding that the app would remain an "open platform" serving various grocery and specialty food stores. Judith McKenna, chief executive of Walmart International, said in a statement that the deal was expected to provide a learning experience for the company's other markets.